The European Union is a powerful bloc. Around 500 million people live within its 28 member states. Their combined Gross Domestic Product (GDP) was $18 trillion in 2014, making it the largest or second largest economy in the world. The EU is also an important market for Israel. In 2013, EU exports to Israel amounted to €17.9 billion while imports totalled €13.5 billion. It is Israel’s biggest trading partner. In 2013, 32 per cent of Israel’s exports went to the EU and 34 per cent of its imports came from Europe; both figures exclude the trade in diamonds. Those who drafted the agreement considered respect for human rights to be important. “The agreement states that the respect for human rights and democratic principles guides the internal and international policy of both Israel and the EU and constitutes an essential and positive element of the Agreement. 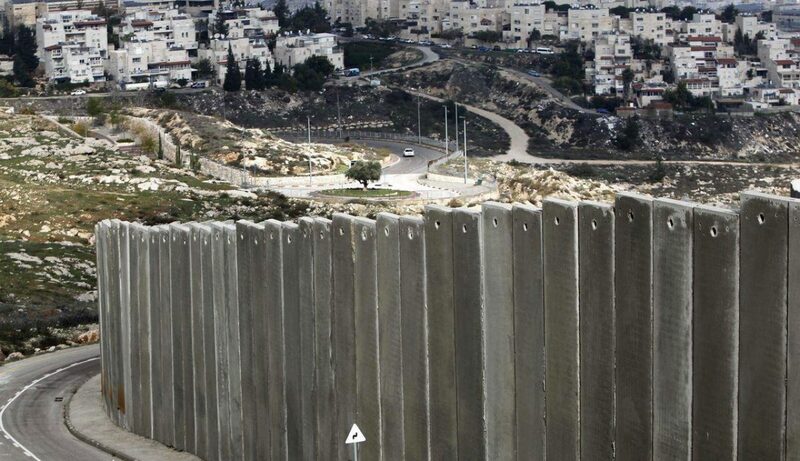 At Israel’s request, there is a Joint Declaration on the importance both parties attach to the struggle against xenophobia, anti-Semitism and racism.” This should have strong implications given the nature of Israel’s occupation of Palestinian territory. In culture, Israel is again singled out for participation (despite being located outside Europe) in the EUROVISION song contest, and its football clubs and the national team are members of UEFA, playing not in its geographical continent of Asia but as part of Europe. In 2013, Israel hosted the UEFA under-21 championships. Neither privilege is offered to Palestine and its football team. The EU’s trade with the Palestinians is much more modest, totalling €154 million in 2014. Significantly, Palestinian exports only amounted to €14 million, due to the “difficult economic situation and restrictions on movement and access”. In terms of aid and financial support, the EU is the largest donor to the Palestinian Authority, essentially supporting it in covering 25 per cent of its salary commitments. It also supports the UN Relief and Works Agency (UNRWA) in its delivery of services to Palestinian refugees. The EU is, therefore, a major stakeholder in Palestine-Israel, which has allowed it not only to develop trade relations with both parties but also to play a role in the search for a peaceful resolution to the conflict. It is a member of the Middle East Quartet, alongside the US, Russia and the UN. It supplied the Quartet’s Peace Envoy, former British Prime Minister Tony Blair from 2007 to 2015. However, it has always shied away from playing a leading role, in deference to the US. It has, as a result, not punched at its proper weight, never mind above it. This is a great pity, because its position allows it to exert pressure on the two parties should it choose to do so. However, it has chosen not to apply significant pressure on the Palestinians by, say, withholding aid, as it realises that it could lead to the collapse of the PA, which would reduce rather than enhance the chances for peace. On the other hand, it could apply significant pressure on the intransigent Israeli government without the state itself “collapsing”. In reality, it has only chosen to apply minimal pressure on Israel; while it has a clear position on the illegality of Israeli settlements in the occupied West Bank and East Jerusalem, it has not taken the logical step of at least banning the import of any goods from them, despite condemning settlement expansion on numerous occasions. Instead, it has taken decades to reach agreement among its member states to require accurate “labelling” of certain goods originating in illegal settlements to help European consumers make an informed choice about whether or not to buy them. Incredibly, it has not even taken action against Israel when the latter has demolished civilian buildings and facilities paid for by the EU, particularly in what is called “Area C”. The EU’s envoys to the Palestinian Authority frequently produce reports on the deteriorating situation on the ground in Palestine, which show clearly that Israel has no intention of allowing, let alone working towards, a two-state solution, which is at the heart of EU policy. In their report in 2015 they slammed Israel’s actions in East Jerusalem and urged the EU to take actions to “strengthen” the PA’s status in the City. They also advised “taking various measures to protest [against] Israeli policy in the city, as well as sanctions against people and groups involved in ‘settlement activity’ in and around it.” In June 2015, envoys from all 28 EU member states sent a clear message to Israel that the EU was against the planned demolition of Khirbet Susyia in the Hebron Hills by visiting the 300 Palestinian villagers en masse in a show of solidarity. 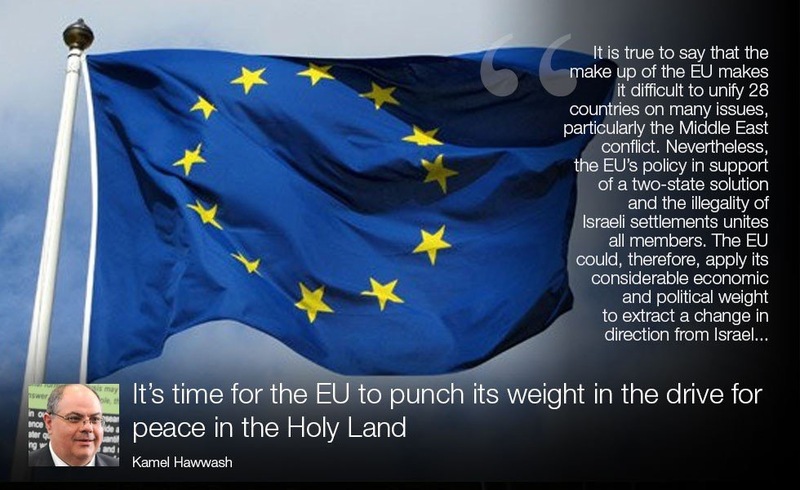 Such encouraging signals serve to raise Palestinian expectations that the EU will move from condemnation to action. However, to date, the reality has been regular raising of hopes only for them to be dashed when the crunch comes. Take, for example, the recent move by the EU Council of Ministers to “distinguish” between Israel and the areas it occupied in 1967. This would have meant that the settlements would not be considered as part of Israeli territory. Once again, Palestinian hopes were raised about action. This position was watered down, though, under pressure from Israel and, surprisingly, Greece, which was once a supporter of Palestine but is now increasingly an Israeli ally. It is true to say that the make up of the EU makes it difficult to unify 28 countries on many issues, particularly the Middle East conflict. Nevertheless, the EU’s policy in support of a two-state solution and the illegality of Israeli settlements unites all members. The EU could, therefore, apply its considerable economic and political weight to extract a change in direction from Israel by supporting a move by the Palestinians to specify a date for the end of the occupation. Should a resolution to this effect pass without a US veto during President Barack Obama’s last few months in office, then sanctions on Israel could follow. This needs to happen before Israel succeeds in diversifying its export markets, thus reducing the impact of EU sanctions. In conclusion, if the EU was to punch not even above its weight but at its weight, it could change the dynamics in the conflict in favour of an end to the occupation. It must emerge from its self-imposed shyness and act. Once that barrier has been breached, perhaps peace will be that little bit closer.